As you know, our neighbor is building a new fence between our two properties. He just demolished the last section of old fence yesterday, and I hastily remembered to take a picture of the difference of our soil levels, before the last few boards go in. Forgive the photo quality, I was hot and sweaty and the phone slipped. Please note the difference between the height of our neighbor's yard (where I'm standing) and our yard (you can see an orange leaf on top of our ground). I was over the moon when I noticed this. You may wonder why some dirt got me so excited. It's because we've worked so hard to get to this place. When we moved to this property nearly 14 years ago, the yard was covered in a green substance, some of it mowed to look like a 'lawn' and some of it left to its own devices. It was a mixture of mostly bindweed and Bermuda grass, and it served as a play surface for our children when they were little. When we took out the edges to install a fence and plant some flowers along its border, we first discovered the nature of our soil; rocky and dense with heavy clay, it was nearly impossible to dig into. Over the course of our first eight years here, every time I put in a plant, I would remove boulder-sized chunks of rock and clay and put them into our compost bin, and replace that dirt with compost. As the children got older, parts of our yard were sheet-mulched to remove the grass-like substances and weeds and improve the soil. After six months of rotting, those areas were planted to either ornamentals or crops. Over the past six years, we have completely transformed our property by doing this, step by step. I add organic matter all the time, in the form of both homemade and store-bought compost, animal manures, rotting leaves, grass clippings from my neighbors, sawdust, and wood chips. We still have trouble digging in several areas of the garden, no matter how much organic matter I've added. I have come to like my clay soil and appreciate it for its nutrient-and-water-holding capacities, but that has not stopped my efforts to increase the percentage of soil organic matter. While we've noticed a proliferation of micro-animals in the soil, and our plants perform well, we were never really sure if anything we were doing was making a difference. And after the last couple of months, watching the soil levels as the fence has been demolished and re-built, and seeing between 4-8 inches of difference in the soil level in each section, it's confirmed what we had hoped: We have been successful at building new soil. Soil erosion is one of the biggest problems our country faces. 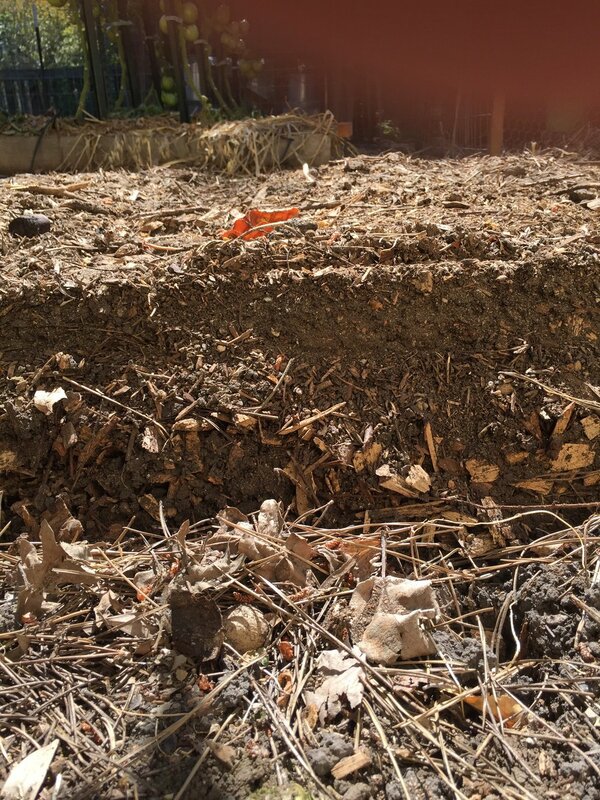 Constant plowing of soil, removing vegetation and trees, and new construction all serve to remove the top layers of soil at an alarming rate. According to Dr. David Montgomery (a geologist at the University of Washington and author of many books on my favorites list, check 'em out) has estimated that we are losing about 1% of our topsoil every year to erosion (most due to agriculture and loss of forest). In nature, soil forms at about the rate of one inch per 1000 years (in tropical climes, it can be half that time). Here at Poppy Corners, we have grown our soil at the rate of about an inch a year, in the last six years. This is ASTOUNDING. Simply by adding organic matter, keeping a living root in the soil at all times, using no-till methods, and eschewing chemical inputs, we have grown our soil at an amazing rate. This is proof that what we do makes a difference. We are stewards of the small piece of land here on the corner of a neighborhood and we are becoming GOOD stewards. All of us who own property can be a tiny part of the solution and not the problem. This is exciting! So let's continue: Making compost and wasting nothing that our property produces; taking organic matter out of the waste stream and adding it to the land; moving and dumping wheelbarrows full of plant 'waste' on our yards. This pictures shows that it makes a difference.